If you’re the gateway to what your family eats, chances are likely that you’ve seen, studied or even gasped over a Nutrition Facts label. Perhaps you’ve even noticed a few changes to that trusty little box you rely on so heavily for checking the sugar content of your children’s favorite cereal. 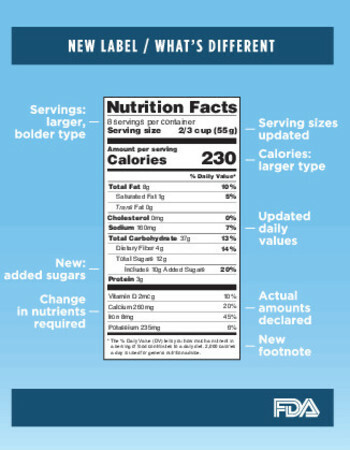 The Nutrition Facts label is different alright – the FDA announced changes in 2016 to help you make healthier, more informed choices. So what are those changes? The bigger print makes the most basic nutritional information easiest to read. What’s missing from your label? The “calories from fat” section has been removed. The reason? Experts say it’s more important to consider the type of fat rather than the amount. Vitamins A and C? Also gone. Research indicates that we’re getting plenty of these vitamins in our daily diets, and it would be rare for anyone to have a deficiency in either of them. What’s been added to your label? Vitamin D and potassium have been added to the label because, unlike vitamins A and C, experts suggest we are not eating enough foods containing this vitamin and mineral. When we consume too much sugar, it’s difficult to meet our other nutrient needs. Our goal should be less than 25 grams of sugar a day. Recommended serving sizes had not been updated since 1993. The serving sizes listed on the new label reflect the amount of food and drink people are actually consuming today. For example, the serving size of ice cream used to be 1/2 cup, but it’s now 2/3 cup. The “servings per container” section has also been updated for products that may be between one and two servings, such as a 20-ounce soda. These products are now considered one serving rather than two or more, and the nutrition information reflects this. 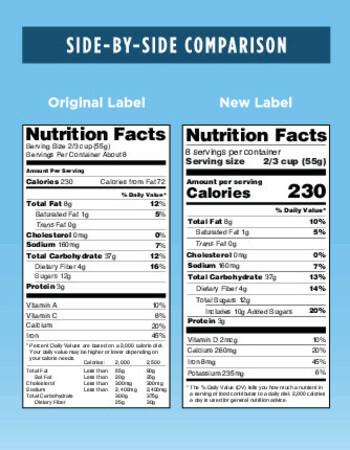 For products containing two or three servings, the manufacturer is required to have a “dual column” label. One column shows the nutrition information for one serving, and the second column shows the nutrition information for the whole container. Based on newer scientific information, recommended Daily Values (DV) for various nutrients have been revised. As a result, you’ll notice slightly different percentages between old and new labels for the same product. The footnote at the bottom of the label has also been changed to provide a better explanation of what “% DV” means and how these percentages fit into your daily diet. These percentages are based on a 2,000-calorie diet, and depending on your health goals, individualized needs should be discussed with a registered dietitian. Because some manufacturers have until 2020 to comply and others have until 2021, you may see either label on food products for some time. Regardless of what label you see, proper nutrition plays a critical role in good health. Taking just a few minutes to scan your labels can help set you and your family up for a lifetime of wellness. Martha Nepper, PhD, RDN, LMNT, CDE, is passionate about healthy eating and nutrition. Her favorite part of being a registered dietitian nutritionist is seeing someone become healthier through better nutrition and adding more activity in their lives. You can find Martha helping patients with healthier nutrition at the Methodist Center for Diabetes and Nutritional Health.